A couple years a ago we sprigged the small tee in front of the lodge with Mini verde Bermuda grass. 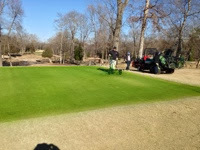 This grass is used down south for putting greens. We wanted to try it in a small area along with providing a place for guest from the lodge to putt while they were staying over night. 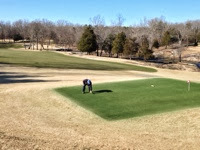 The Bermuda grass is painted during the winter months to provide color. The canopy is to thick for overseeding. The paint provides a good contrast. 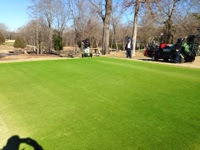 Did you put a cover on it this winter when it was bitter cold?